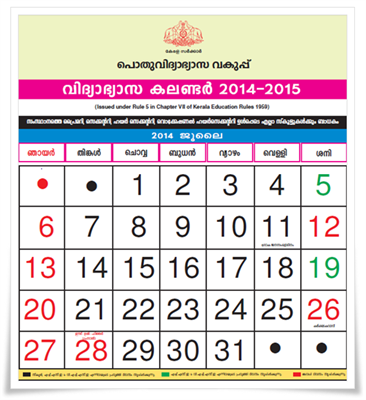 The Kerala education department known for its innovative approach in tutoring the young generation has released the School Calendar for the academic year 2014 -15. After the implementation of number of activities aiming at the quality development, now the department has prepared the complete calendar which would enable the teachers and students to know the programmes for the whole academic year. Other than preparing much prior to the respective date, teachers can guide the students and add more colours to the activity and make it more attractive. All primary, Secondary, Higher Secondary and Vocation Higher Secondary Schools in Kerala should have to follow the complete academic calendar which is bring issued under Rule 5 in Chapter VII of Kerala Education Rules 1959 . This multicoloured calendar is well designed to give a dashing look. The importance of each day is arranged in such a way one could read and know even standing at a long distance. As much care has been taken in arranging the content, the information provided in it can be closely analyzed. Other than giving details about the upcoming events, we can get a broader awareness on the impending programmes. As the education department has taken a step forward with a novel approach to kindle the edification process, it should be well appreciated. Another highlight of this calendar would be the proper arrangement of activities to be conducted between the period June 2014 – April 2015. Well preparation prior to the proposed date can avoid chaos and keep the students and teachers in good position. Extracurricular activities both sports and arts would give much refreshment for the students in between the exam schedules. Some of the important days to be observed include Reading Day (19th June), Higher Secondary Day (1st August), Teacher Day (1st September) and Children's Day (14th November). The SSLC exam would start from 9th March while the Plus One Plus Two exams would be held between 9th March to 21st March 2015. Students, teachers and parents can benefit much from the academic calendar published by the education department. Do follow the link below to download the academic calendar.